(November 30, Colombo, Sri Lanka Guardian) The Sri Lanka tea sector has been enjoying increased prices across the board for all teas from January 2007 up to July 2008, a period of almost 18 months. This was due to several reasons, both global and local. Among the important reasons are (a) drop in production in some competing countries due either to political and/or adverse weather conditions, (b) increased buying power, especially in the Middle East and Russia/CIS regions due to oil price escalations, (c) promotional efforts of the sector especially highlighting health benefits of tea, (d) tea being preferred as a beverage as against other beverages at least by a higher percentage among the younger generation, and (e) value additions made by the industrialists. 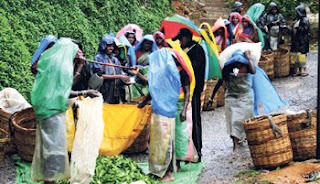 However the downward trend in tea prices started to manifest from July 2008. The drop was affecting the low grown sector more than the high and medium due to the fact that almost 70% of our teas for the last several years were being exported to the Middle East and Russia /CIS regions, which regions were affected earliest by the plummeting oil prices. Both Iran and Iraq in this region are countries which are within the first 10 buyers of our tea. The month of September was of particular interest as unfortunately low buying was experienced during this month due to Ramazan falling in this month which aggravated the situation. Although this is generally common knowledge in the tea sector that “bought leaf factories” (almost all factories belonging to the private tea factory owners are fed by low grown tea produced by the smallholders) this fact may not be known by many. Another fact that one must remember is that the green leaf supplied by the grower is being paid on an age-old formula given by the Tea Commissioner under regulation based on the National Sales Average (NSA) which again is dependant on the prices at which tea is sold at the weekly auctions. Consequently this means that any drop in sales price would inevitably pull down the price the factory pays the green leaf producer. Being a very well organized sector, the tea industry through its apex body, the Colombo Tea Traders Association (CTTA) and the Chamber of Commerce, conducts the weekly tea auction where buyers bid for tea through the licensed brokers, the operating brokers being eight as at today. The age old system in the tea sector is that the brokers make advance payments to the producers for the tea that is sent to the auction and the producers pay advance to the green leaf suppliers and/or dealers and settle the full amount after the Tea Commssioner publishes the amount payable for the green leaf suppliers. The supply chain -- the brokers, buyers, green leaf producers and the dealers are all obliged by regulations to keep to certain “prompt dates” for settlement of payments, the last link being the grower. When the prices were good and it was “summer” for the industry, all the players in the supply chain were paying “futures prices” to the one below in the hope that the situation will be better and better week on week. But unfortunately this expectation did not materialize resulting in the present crisis. Although the rise in prices was slow the drop was unfortunately very fast! The situation was aggravated by the producers who were used to produce even more than their capacity by buying green leaf of lower quality consequently producing poor quality tea. But fortunately prior to the impact of the crisis, everything was selling encouraging them to go on happily. Unfortunately the prices came down so sharply and therefore by the time they realized it was not going to come back to the former levels everybody in the supply chain was in debt to the one above! It was also unfortunate that the players in the sector throughout the supply chain were all used to a particular spending pattern in keeping with the incomes enjoyed during the good times, and therefore it was difficult to adjust downward! The relationship that the producers have developed with the brokers is such that brokers have become their unofficial bankers as they advanced monies to producers so that they in turn could pay advances to the green leaf suppliers. All these advances are known to be at certain rates of interest mutually agreed upon between the parties. It has also to be remembered that almost all the producers have exceeded their borrowing limits with their respective bankers and therefore when the cash crunch hit the industry it was a real shock. So it was natural that the disruption in the chain affected the smooth functioning of the system. This is how the crisis started. When the banks could not help any more under normal circumstances, and the unofficial bankers could not help either, the ultimate rescuer became the government. Hence the pressure from all the stakeholders, the buyers, the brokers, the producers, the green leaf dealers and the smallholder growers for a rescue package! It is also true that while all other currencies were depreciated the world over, the fact that the Sri Lanka Rupee was being kept at an artificially high level had an effect on the market. On top of it certain buying countries like Russia were quick enough to even restrict foreign exchange remittances abroad thereby limiting buying power. Other buyers especially in the Middle East, where the banking sector was quite strong and resiliant, were adopting a “wait and see policy” expecting the prices to come down further. It is in this context that the Sri Lanka Tea Board (SLTB) on the directions of the President had to enter the auction floor to purchase teas in order to build confidence of the buyers. This intervention did have a very salutary effect and at the 43rd auction the prices started to get stabilized. Although the SLTB participated at all auctions from that week downwards it did not have to purchase teas as the competition among the buyers was reasonably good. From the results of the auction it can also be summarized that generally the high grown teas and better quality good teas, whether low grown or high grown, fetched considerably good prices. The demand was reasonably good and the prices held comparatively firm. But the withdrawals from the auction were still higher and the prices fetched by poorer grades were lower which resulted in the NSA being lower. Even though the situation appears to be slightly better than what it was a month back, one cannot rest assured that it will get to normal levels soon. The coming weeks are generally lean weeks every year. On the other hand with the New Year approaching, both the small growers and the workers and factory owners would all require more money than they require during a normal month of a year. Against this backdrop, while some of the cash strapped producers started to refuse to buy green leaf and refused settling their dues to the green leaf suppliers, some others even went to the extent of cashing in on the troubled situation by threatening to close down factories thereby forcing the leaf suppliers to either agree to sell at unreasonably low prices or agree to be paid for lower quantities than they actually delivered! Although the government stepped in to help the industry by giving a good hearing to the grievances that the sector has, it has got to be admitted that the only mechanism through which some relief was to be granted, namely the Stabilization Fund, established a couple of decades ago was not available by this time. The restoration of the Fund naturally has to go through certain procedures, which takes time. In the interim the government with the Central Bank interference, has given the SLTB access to Rs 500 million on a refinancing scheme, later to be regularized when the Stabilization Fund is restored. Among the relief measures so far offered to the tea sector are -- (a) for the buyers to avail themselves of the facility of paying 20% of down payment within the seven day period and the balance 80% to be paid on the 28th day, (b) buyers to avail themselves of loan facilities from the commercial banks through which they operate, such loans attracting an interest subsidy of 6% through the Stabilization Fund (purchases under certain conditions only would attract this subsidy), and (c) the restoration of the Stabilization Fund. However some of the tea sector stakeholders do not seem to be so impressed by these offers and are not so keen to take advantage of this loan scheme as the dollar loans are cheaper for them. Both the Private Tea Factory Owners Association and the Planters Association of Ceylon have made appeals to the Ministry of Plantation Industries to consider granting them a working capital loan to get over the difficulties experienced during this period. The quantum of the loan is calculated based on the expected drop in the sales volume due to the crisis. Roughly what they expect is for the government to give a roll over working capital loan facility of at least Rs 2 billion for each category. On the one hand the Private Tea Factory Owners Association shows that they have to depend on the bought leaf which is the livelihood of the grower. Naturally therefore any serious drop in their income is to have direct social and political implications in the low grown areas. On the other hand the Planters Association of Ceylon shows that they are obliged to provide 300 days work for the labour force whether in sun or rain. So any drop in production due to sales not being possible would put them in a very difficult position. Labour unions in the High and Mid-grown areas are so strong and therefore any disruption in the source of income for the labourer will result in social and political unrest. If we go by the requests made by both the Planters Association and the Private Tea Factory Owners Association, calculated on the basis of certain statistical data, the requests seem to be reasonable. They have also shown that loan repayment has been done in earlier similar instances promptly through the selling brokers which have proved to be prompt and convenient for both the borrower and the lending bank/s. Among other suggestions made are --(a) rescheduling of existing loans (b) low/concessionary loans, and (c) for the Regional Plantation Companies to issue Debentures for substantial amounts for a sufficient period. The authorities, namely the Ministry of Plantation Industries and the Treasury in association with the Central Bank have to come up with solutions to match these requests having evaluated them. The smallholder sector is requesting that the government pays a subsidy on the leaf price to compensate the drop in prices. Although this could have been considered if the Stabilization Fund was existent, the government cannot be expected to subsidize the leaf supplier to this extent. Even if it does agree for how long can the government do it? On the one hand it would be a bad precedent and on the other it would be impracticable leading to a lot of monitoring difficulties and abuses all the way. Although government intervention through the SLTB to buy tea at the auction was a good move to boost the confidence of the buyers, this is neither a solution for the problem, nor can the SLTB continue to do it for a longer time because the SLTB in any case has no mandate to replace a buyer. If the tea that is bought by the SLTB is coming to the same market, one has to agree that it will dampen the market again. On the other hand it cannot hold on to the stocks indefinitely for obvious reasons. In the long run the market has to adjust itself and the sector has to adjust itself. But for the long term, the government has the responsibility to set up a system to take immediate action in times of a crisis like the one we are experiencing now. At different times certain mechanisms like the Consolexpo have been available. Still there are other options like forming a government-controlled company are available. But such measures have inherent problems as experience would show. The best mechanism for the present is therefore the Stabilization Fund, which has to be restored forthwith. How it can be used to help the situation is a detail which should be worked out depending on the situation.